Follow the clues given to you by a mysterious note and a strange longsword in order to find an unusual treasure (non-journal). The sword leads the way. Find and read the strange note on the eastern side of Fort Coldcorn outside the fort. Find the hidden treasure by following the clue you have been given. So do as the note reads and follow the direction the blade is pointing in (if you picked up the sword too quickly: NE) for half a mile. 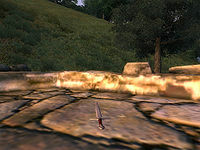 The dagger is a boss-level dagger that will always be of the best possible quality for your character's level at the time they first entered the vicinity of Fort Coldcorn. At level 3 or above, there is a 25% chance the dagger will be enchanted. This chance rises to 40% at level 6 and 50% at levels 9 and above. This quest is identified in the construction set as an easter egg. The first note is labeled "ClutterEEgg00FortColdcornLoot", the "Note of Bounty" is labeled "ClutterEEgg01", and the reward chests are labeled "WildernessChestFortColdcornEEgg01" and "WildernessChestFortColdcornEEgg02". This page was last modified on 24 October 2018, at 06:34.